Is the fireplace old fashioned? I have bought a very dated property that needs a lot of work. I’m thinking the tv needs to go either next to or above the fire and I’m unsure if I should keep the brickwork. The fire will be changed for another electric one built in but a good looking one. Any advice would be much appreciated. Obviously the carpet will be changed! We're stuck with a stone fireplace wall. It was a depressing green stone that I just had to paint over. I used white emulsion, three coats. Paint might be a welcome disguise until you decide whether to remove it. The white definitely softens it a lot. If I can’t decide in the next couple of weeks I may go with this option before the walls get painted. Thank you for sharing your idea. 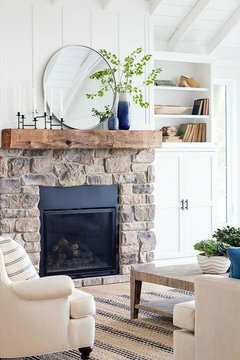 Should we keep our old fireplaces? The Edwardian fireplace is the correct proportion and age for the house. Hard to tell if it is actually original to the house or if it is Mahogany or Oak, but don't paint it. Wood has a beauty of its own if treated with a natural finish like Beeswax and the patina of age adds to the beauty. Certainly don't varnish it. One of the reasons it appears heavy in the photo is the oak surround on the hearth tiles. 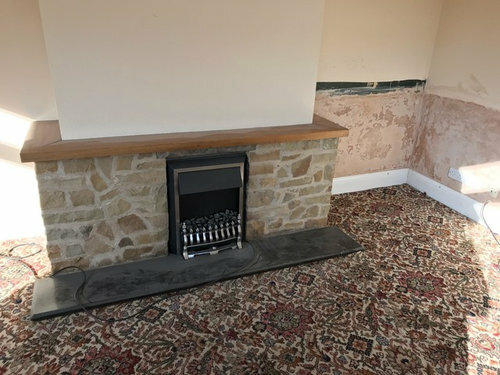 My advice would be to remove the wood hearth surround and install a wood floor in the room (perhaps oak and slightly lighter in colour than the fireplace butting up to the tiled hearth). This will will compliment the fireplace and ground it. 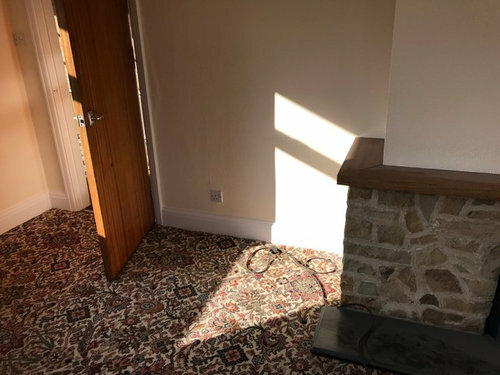 You could remove the tiles (normally I would keep original tiles) but the cream and maroon colours in this instance do give an overall heaviness and don't particularly enhance the fireplace, however I would leave the tiles for the moment. The finished scheme should look classy and elegant with a neutral colour palette. If this is going to be a working fireplace than you may consider a grey slate hearth. This is the focal point of your room so getting it right is key. Wherever possible conserve original features. The 1930's fireplace on the opposite side would appear original and most likely installed in the 30's. It is charming but not proportionally correct for an Edwardian house. But because it tells a story and is original I would be loath to remove it. Selling it on would be tricky as the tiles will most likely damage when removing them. 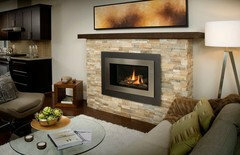 I would keep both fireplaces as they will both sit well in a neutral colour scheme with a wooden floor. If you're going to the, trouble/expense of a new fire and carpet/flooring now, I'd definitely do the extra work now and remove it. Otherwise when you come to do so it will have an impact on the new flooring /decor, etc. The insert is old fashioned but the stone is very 'on trend' (hate that expression. If you do a room scheme that is quite neutral with lots of textures it could look really good. Thank you I appreciate your advice. Struggling to visualise it but I think the neutral colours may work well with a new insert. Just got to figure out the fire type and colour scheme now. I think it’s ok. It’s not overpowering in the room. The thing that stands out is the wood on top which I’d think about trying to lighten or paint. Looks like you have a nice slate hearth. I quite like it, especially the warm colours in it. I love natural stone in all its forms and think it could look good. Maybe paint the wooden shelf all around it white/off white and keep the colour scheme within the room warm whites, taupe, tans and browns. Look how trendy it can look! That looks really lovely. Thank you so much it’s given me some great ideas that will save me knocking anything out and making the most of what’s already there. If your room need plastering, consider removing the entire chimney (at least the most of it, it's quite wide). And then maybe placing a smaller one. Personally I dislike electrical fires, so if not for heating, I'd leave it out. Is there a chimney that goes towards the roof? Because if so, it'll need structural support. If the room doesn't need plastering, just replace the wood for something thinner, just sticking out the stone for a few mms. Paint it white or the grout color. Remove the floorplate. The stone is a nice feature. I think if you style the room like this it could work. @jillyhilltop, do the letters H-I-Q-V mean anything to you? I wonder if MI6 communicate on Houzz?! E D I've had the brass stencil letters since the mid 80s. I came across two sets. Unfortunately there wasn't an H, I, Q or V in the large set and sadly no Q in the smaller ones. Bizarrely despite having had them set out in various homes over the years I'd never noticed that the small ones read HIV until a friend who's genuinely OCD noticed it 3 weeks ago! How didn't I notice that?? That is some major detective work! I didn’t notice and you can’t tell unless you really zoom in. I think you need to make the stonework narrower and higher to update it. Fortunately you should be able to use the existing stone to do this. I think I’d take the lead from whether you LIKE the fireplace or not. If so would you keep it as is or paint it? Then go from there as its the ideal time to rip it out if you decide it’s not for you no matter how trendy it may or may not be. If you keep it - I think you are right to add a more fitting fire and tv placement would depend on how much it makes you crane you neck and how well you can hide leads etc. My parents had a similar fireplace when we grew up with an extra matching brick area to the right which my Dad build to put the tv on and he even made a cupboard for the vhs to go in! It's a No from me.....................the fire isn't even in the middle is it? I'd have to bang it all out, centralise it and then go from there.